Through our Day Program, individuals with intellectual and developmental disabilities explore many different avenues to support personal independence and promote social, physical and emotional well-being. Day Program experiences at The Enrichment Center include Visual Arts, Performing Arts, Culinary Arts and Functional Life Skills. 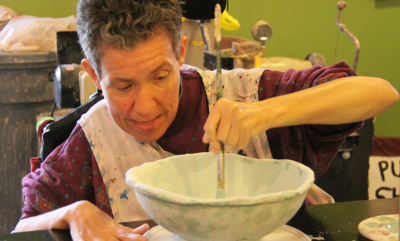 Experiences are geared toward increasing and maintaining skills that assist individuals with intellectual and developmental disabilities in being an integrated part of their community. Socialization with peers and the community through integration. Advocating for rights, needs and choices. Individuals served in The Enrichment Center's Day Program care deeply about helping others in the community, and actively volunteer with a variety of community-based organizations including: Forsyth Humane Society, Hoof & Paw Therapeutic Riding & Activity Center, Kaleideum, Second Harvest Food Bank of Northwest NC, SECU Family House, Senior Services, The Centers for Exceptional Children, Twin City Kiwanis Club and the William G. White, Jr. Family YMCA. We also offer Respite Care on Saturdays -- learn more here. If you are interested in applying, please contact Sheryl Hardin at 336.837.6856 to schedule a tour and learn more about our admission process. Have questions about the Day Program? We’re here to help. If you are interested in applying, please contact Sheryl Hardin to schedule a tour and learn more about our admission process.